One of the most important social skills is the ability recognize, distinguish and label one’s own emotions and the emotions of others. A great way to help develop this skill is to begin reading books that describe and picture feelings to young children. Other ways you can develop children’s skills of identifying, understanding, expressing, and coping with emotions is to discuss feelings they witness while watching tv, movies … and MOST IMPORTANTLY the emotions expressed at home. Label and discuss your own emotions! Help children understand that ALL emotions are ok … and that it is how we handle our emotions that can sometimes be good or bad. For example, getting angry and frustrated because the kids just pulled all the books down from the shelves when you just cleaned that room is normal … you can say, “Wow! I am really angry about this. I’m frustrated that I just picked up all these books and now they are on the floor again.” Later (after they help clean up!) and you are calm again … you can discuss how you felt and what you DIDN’T do … you didn’t yell or throw the books. You stated your emotions. NOW, if you DID yell … that’s ok too (you are human … and learning). Talking about how you did NOT handle your feelings well is also very important. The same goes with saddness and grief … don’t be afraid to let your children see you FEEL. We teach them SO much from modeling our reactions … teaching them about emotions shouldn’t be any different! Stay tuned for future posts! I plan to share play therapy activities that I use to help children identify, express, and cope with emotions … as well as more books and activities on specific emotions, such as anxiety, grief, anger, jealous, and fear. This summer I participated in the Love Books Exchange coordinated by Educator’s Spin On It. 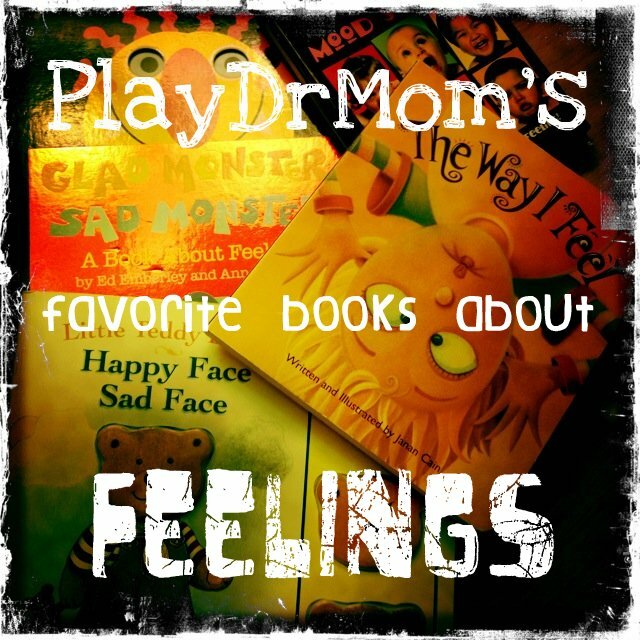 Since I AM PlayDrMom I figured I just HAD TO send a book about feelings! Check out what Krissy’s kids over at B. Inspired Mama did with the book and project we sent! And come back tomorrow to see what Krissy sent us!!! First of all, THANK YOU for the Today I Feel Silly Book. The kids just loved it and I really enjoy reading it to them, too. We made a fun emotions matching game and book inspired by it. Now I can’t wait to see if our library has any of these others! I love all of Jamie Lee Curtis’ books. She has one on adoption that is very good: Tell Me Again about the Night I was Born. Children love the beautiful illustrations. I like her movies, books and even the yogurt she promotes: Activia. Today I Feel Silly is wonderful! Great list! I like to use My Many Colored Days by Dr. Seuss with my older (9-12 year old) clients. Thank you SO VERY MUCH for posting. I will definitely be doing this with my 5 year old who has recently started screaming her lungs out, stomping up the stairs, and repeatedly slamming and opening/slamming whilst screaming when she told off or sent to a time out. We are at our wits end and every is getting overloaded emotionally.